There is something special about a golf course in the middle of the city. 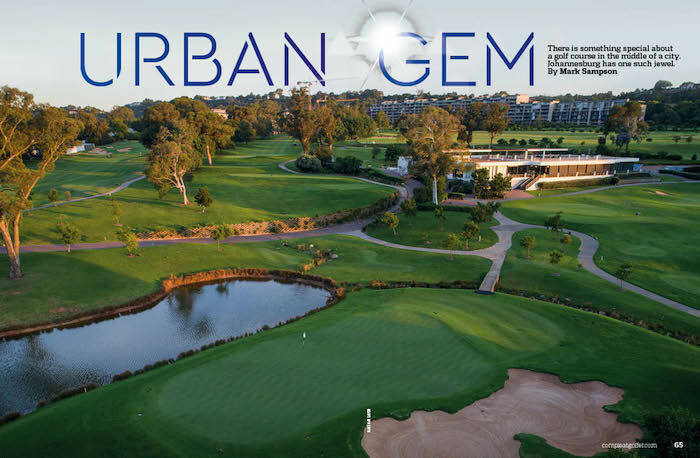 Johannesburg has one such jewel in Houghton Golf Club, writes MARK SAMPSON in Compleat Golfer. A city course adds a wealth of value to the area: a greenbelt, wildlife sanctuary and accessibility. Although Johannesburg professes to be the largest man-made forest in the world, the greenery of a golf course is something to behold among the roads of suburbia. Houghton GC is one such course, situated in the ‘old’ part of Johannesburg: north-east of the city centre and nestled between the established areas of Parktown, Rosebank and Orange Grove. Besides the greenery, it is also a sanctuary for fauna and flora and borders the well-known greenbelt of the Wilds. The club started in 1917, known as the Houghton Estate Golf Club, near Old Edwardians, but in 1921 it was forced to move and many members sought another club. Fortunately, one member offered the club the land on which he had been growing eucalyptus trees to be used in the mines. The designer, AM Copeland, who was also the first club professional, shaped the course through the trees and along the undulations. Many changes were made thereafter, but in 2007 the club decided on a radical makeover and brought in the Jack Nicklaus design group. The task was a complete redesign of the course, with new greens and more bunkering (large, deep bunkers, at that) to strengthen the slightly short layout. It is not that much shorter than most courses in South Africa and off the championship tees it plays a formidable 6 708m. Glendower is 6 899 off the tips and Gary Player Country Club 7 105. Essentially it is a parkland layout meandering through mature pine and eucalyptus trees, similar to numerous Joburg courses. The bunkers, though, are typically Nicklaus, like those found at Pecanwood and Pearl Valley. The final element to a new-look course was contouring the greens with subtle slopes, increasing difficulty when cut short. It has a good combination of short holes; narrow, challenging par fours and thepar fives all around the 500m mark. Ithas a number of memorable holes. The 1st is a perfect example of what to expect. It is a short par four (328m), but the landing area is splattered with bunkers and the fairway rises to a well-protected green. Accuracy off the tee and for the approach is needed at Houghton, with the driver best left in the bag on most occasions. The 4th is a long par four, at 395m, played from a high tee box with a great view. The fairway below slides from left to right with a water hazard that needs to be cleared. A well-placed bunker on the right half of the landing area should influence your club selection. The raised green has a massive bunker short and a strong drop-off to the right. Take into account the elevation on the approach. The par-four 12th at Houghton was the signature hole, but it is being reconstructed. When finished, it will have a right-to-left fairway and a small semi-island green. Water right and a bunker left make it a difficult approach. The par-three 9th is now the signature hole. See page 71 for guidance from PGA professional Richard Kaplan on how to tackle it. The 18th is one of the more memorable holes, with a well-deserved stroke-three rating. From the tee a chute of eucalyptus trees needs to be split before reaching the right-to-left fairway. A draw is favoured in order to avoid a massive fairway bunker right. Ideally, stay on the left side of the fairway to open up the green. Guarded by two gumtrees on the right – one, called Jack’s, is reputed to be over 100 years old – the green has a large, undulating surface protected by a water hazard on the left. It’s a strong finishing hole. Like many urban courses, Houghton Golf Club has come through some tough times. Land of this size is always under scrutiny by would-be developers and no doubt has substantial value. In tough times, selling off portions of the land or building and managing the property has been required to keep the course moving in the right financial direction. Houghton Golf Club has hosted the SA Open eight times and the Alfred Dunhill Championship on one occasion. The ‘new’ layout has yet to host a major tournament and time will tell whether the changes are of the required standard to be able to do so. The clubhouse is the centre of the course, literally and figuratively, as the layout meanders back and forth clockwise. Besides its impressive views of the course below, it has a number of facilities aimed at business needs. Its proximity to the CBD and Sandton makes it convenient for business travellers. Houghton Golf Club has a unique elegance. Its location, in the middle of old Johannesburg, the layout with its jagged, deep bunkers and the large, eye-catching clubhouse all contribute to this. Walking through the clubhouse with the large bar area, pro shop on one side and offices on the other, it has a slick working ambience. That air percolates on to the course, with well-maintained fairways and greens making it a memorable layout and experience. – This article first appeared in the March issue of Compleat Golfer, now on sale!